1. Who was your favorite character in the book and why? 2. How is humor used to deal with difficult issues in this story? 3. There are many unlikely friendships in this book. Discuss an unlikely friendship you have had in your life. 1. In what ways can you relate to Thaddeus in Prime Baby? 2. How do Raina’s experiences in Smile make her stronger? 3. How does the graphic novel format enhance each story? This Is Just to Say: Poems of Apology and Forgiveness by Joyce Sidman. 1. What makes apologizing difficult? 2. When is it easier to forgive someone? When is it hard? 3. Has there been a time recently when you’ve had to apologize or forgive someone? 1. How are the mothers in the book the same? How are they different? 2. What might happen if Vlapid went to Ernest’s house? 3. What kinds of things are you expected to do at home? 1. If you had a friend, like Reese’s friend Toon, who you knew was going to be beaten up, how would you respond? 2. Describe a situation where you overreacted in some way. How could you have handled it differently? 1. How does the author use bridges as a symbol in the story? 2. How would Lenesha define “Family”? 3. How might Lanesha’s experience during Hurricane Katrina have been different if she lived with her uptown family? 1. How do you read a graphic novel differently from a traditional novel that’s all words? 2. Why did the librarians want to take over the world? 3. How do the pictures help tell the story? 1. What kinds of things can you do in the city? In the country? In both places? 2. What do you think happened to Frog? 3. Who do you think Country Dog will meet next year? 1. 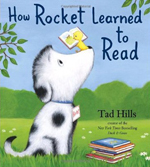 What things did Rocket do that helped him learn to read? 2. What’s your favorite letter of the alphabet and why? 1. What kinds of things can you try to do to keep a pet out of trouble? 2. Toby stayed with Miss Katz for a week. What do you think she did to train Toby? 3. Which picture in the book made you laugh the most? Why?